This year, as we mark our 125th anniversary, Catholic Mutual celebrates the six founding member dioceses who came together to form our organization. We start this month with the Archdiocese of Omaha. Through the course of the year, we will profile the dioceses of Wichita, Kansas City, Salina, Lincoln and Sioux Falls. Just as in 1889, the year we were founded, it is our members who help us stay true to our mission of service to the Church. We invite you to share this newsletter with any staff, clergy or other members of your diocese whom you think would enjoy it. The Diocese of Omaha was officially founded four years before Catholic Mutual was established, but our histories have always been intertwined. When it was created in 1885, the then-Diocese included the entire states of Nebraska and Wyoming. By the time Bishop James O'Connor met with five other Midwestern bishops to establish The Catholic Mutual Relief Society of America (Catholic Mutual Group) in 1889, the Diocese had been divided to include only all counties in Nebraska, north of the Platte River. 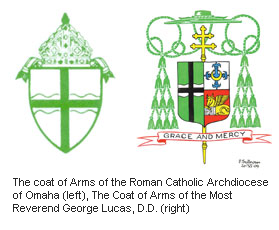 Ultimately, after another split which formed the Diocese of Kearney (now Grand Island), the Diocese of Omaha became the Archdiocese of Omaha in 1945. Just as the world was emerging from World War II, one of the darkest periods in recent history, the creation of a new Archdiocese filled the region with hope and a renewed sense of purpose and energy. There have been 21 new parishes established within the Archdiocese since that time. To date, the Archdiocese is spread out over 13,000 square miles and 23 counties. "The number of parishes, schools and Catholics in the 23-county area of northeast Nebraska has benefitted from steady and consistent growth since the middle of the last century because of the vibrant faith life found in the rural and urban regions of the Archdiocese," says Deacon Tim McNeill, Chancellor of the Archdiocese. Given such a vast territory, Lee Karrer, the Finance Director for the Archdiocese, says that he relies on Catholic Mutual Group to be his eyes and ears as they travel the Archdiocese. He works closely with Claims and Risk Manager Tim Hogan, who has been with CMG for more than 30 years and has assisted with claims pertaining to both God-made and manmade situations. 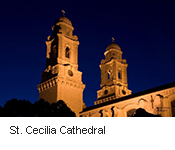 One of the latter occurred in 2007 when a historically significant and valuable painting, The Virgin Immaculata, was stolen from St. Cecilia's Cathedral. While the 300-year-old painting, valued at $100,000 was never recovered, Hogan worked closely with Brother William Woeger, curator of the St. Cecilia art collection, to find a suitable replacement. "We had documentation of the provenance of the piece," recalls Brother Woeger, "and it was all handled professionally and matter of fact." As the city of Omaha expands and the properties owned by the Archdiocese, including the reverentially - and visually - awe-inspiring Holy Family Shrine, increase, Catholic Mutual has worked with the Archdiocese on both new construction and the restoration of older buildings. "Many of our inner city churches have been updated and renovated because of weakening foundations," says Deacon Tim. We know that the spiritual foundations of the churches in the Archdiocese of Omaha are in extraordinary hands. We are proud to take care of the physical foundations.